Look in the churches, and what do you see? Do you see a lot of older women teaching the younger how to be great wives, mothers, and homemakers? No, sadly, you don't...I feel this very keenly, and it saddens me that there is such a lack of Titus 2 teaching these days. Ideally, this teaching should come from mothers to daughters at home, as they are growing up. But the older women in the Church are still to be an example of good things and godly living, to the younger. When I got married many years ago, I didn't have a clue how to be a housewife. It wasn't something my mother ever thought to teach me. Thus I went limping, struggling, into the world of becoming a homemaker all on my own. I had to learn how to cook, clean, keep a routine, raise children, and many more things, without anyone to teach me how. It was a great task to undertake, and it took me years to figure some things out on my own, especially with babies coming one right after another. I am of course, still learning things and always seeking ways to improve. This is one of the blessings of living in our modern times--that we can find ways to further our homemaking education, even if we weren't blessed with a mother who taught us, or if we have no one to turn to in the church. One helpful resource for learning is coming up, so I wanted to let you know about it and encourage you to look into this resource to see if it can help you to learn more about homemaking. 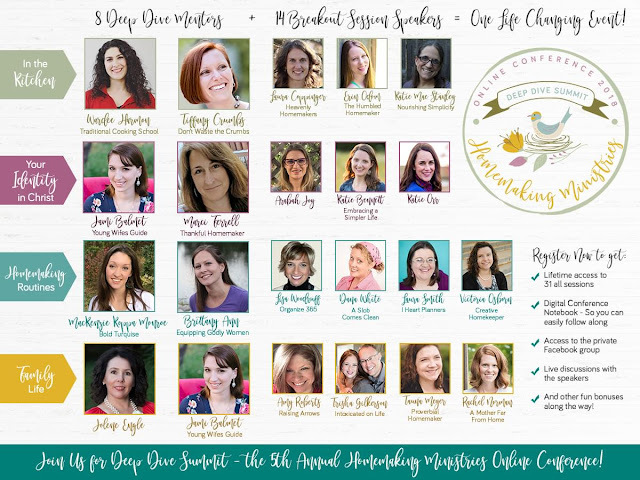 It's the 2018 Homemaking Ministries Online conference which has many talks from different ladies to help you learn more about different areas of taking care of your families. To be honest, I am not familiar with all of the speakers, but I am familiar with several of them, especially in the kitchen category. Those ladies will provide you with lots of helpful information about feeding your family well. Also, Marci Ferrell usually has very helpful information about keeping a nice home for your family. If you even think you could learn a little bit, I'd encourage you to sign up for it, as you will have lifetime access to all of the sessions (which is so helpful since you can take time to listen whenever it's convenient for you). The conference won't take place until September, however, the last day to get the super early-bird pricing is tomorrow, July 31st. The pricing will go up after that. I'd love to hear if you sign up, and if you've found it useful if you've taken part in any of the other Homemaking Ministries conferences in previous years. I know I've been able to learn some good things from past conferences. Hi, I just signed up and can't wait! I've never taken part in any of the other Homemaking Ministries conferences, but look forward to learning all I can! Thank you for sharing this valuable resource! That's wonderful, and you're welcome! I hope you really enjoy it and learn a lot of helpful things. Glad you've been blessed by some of them. I'm so glad we have resources like this available to learn from!